A couple of weeks ago I was out at Anza Borrego and finally took some good pictures of the Milky Way. In fact, I was thrilled at how good they were compared to past attempts. A better camera, a better time of year, and a truly dark spot made all the difference. Anyway, I was so excited that I started wondering just how good a picture my camera could take. You can buy very cheap tracking mounts these days that allow you to take long exposures without motion blur from the rotating earth, and unfortunately I recently received a check I wasn’t really expecting. So even though this was a pretty serious waste of $300, I figured why not? Money’s no good if you don’t use it, amirite? I ended up buying a Skytracker Star Adventurer plus a few necessary accessories, which brought the bill to $400. The big question with these devices is their accuracy. To work well they need to track the sky smoothly and precisely, or else eventually you get blurred stars. The better they are, the longer they can track. Even though I’m using a wide-angle lens, I figured this one would be good for about two or three minutes max. So last night I went out on the front lawn and tested it. As a picture, this would produce only a horror, since my front lawn is about as light polluted as you can get without literally being in downtown Los Angeles. But as a test of tracking accuracy it would be fine, and being near the house would be handy for my first try. The first step is to align the tracker with the north celestial pole as accurately as you can. 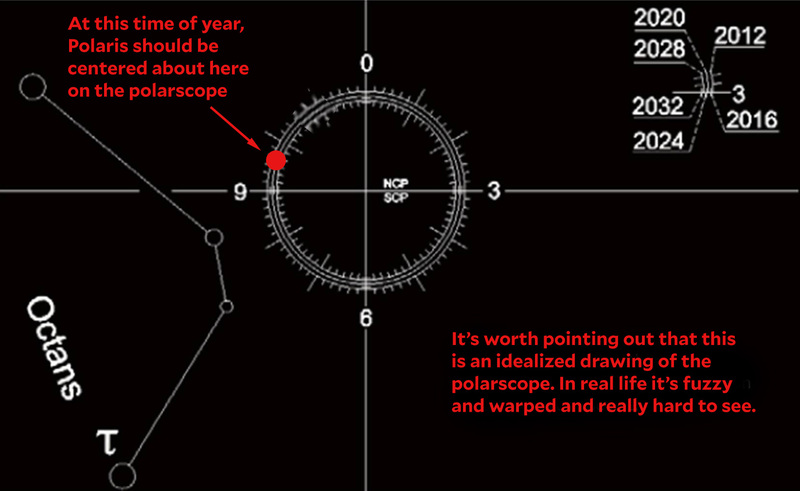 The pole is slightly offset from Polaris—denoted by an etched circle in the tracker’s polarscope—but the direction of the offset changes with the seasons. There were instructions for figuring out exactly where the pole is relative to Polaris depending on the time of year, but I didn’t understand them. Luckily, I happened to know already: it’s between nine and ten o’clock. So I pointed north, raised the tracker to 34 degrees, and within a couple of minutes I had Polaris centered on the etched circle at the right spot. Or so I thought. Without electronic guidance, this is as much art as science. Then I mounted the camera and pointed it in the general direction of the Big Dipper. The tracker comes in half a dozen pieces, which makes it sort of a tottering mess, and my tripod is just an ordinary tripod, not built for super-steadiness. In fact, everything swayed so much at the slightest touch that I began to wonder if it would work at all. But I turned on the motor, eventually got the lens focused, engaged the cable release, and took a picture. That’s really good. The star on the left is Dubhe, the last star in the Big Dipper. It’s the one that points to Polaris. It shows some slight elongation, but not much. The middle star is perfectly round. 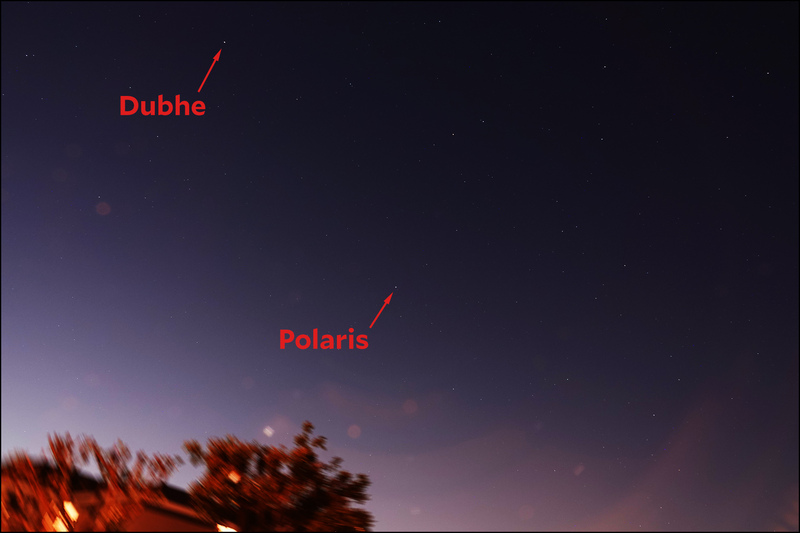 The faint star on the right shows a slight elongation, but even less than Dubhe. I should note that I was using a light pollution filter, which actually works. It’s no panacea, but it produced a very noticeable improvement. All in all, this is far better than I expected. I wonder if I had beginner’s luck with my celestial pole centering? Next Thursday—evil dex night!—I’ll go back out to Anza to find out, weather permitting. What I’m mainly curious about is how good a job the camera can do using just a single exposure and internal noise reduction. I’m also going to take half a dozen shots in RAW mode and stack them in software to remove the noise. This is how serious skywatchers do it, and I want to see how much better it is than just a plain processed JPG file from the Sony. Stay tuned.